Every Minor League Baseball offseason brings with it a cornucopia of new logos, from rebrandings and new primary logos to alternate food-based monikers to Copa de la Diversión identities. But not to be overlooked is the annual crop of anniversary logos released by teams that are celebrating milestone seasons. 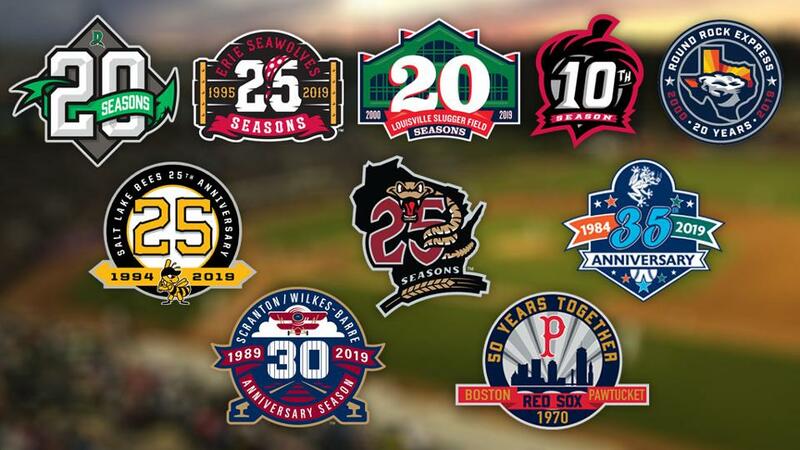 This article scopes out 10 notable 2019 anniversary logos and, just as importantly, how each team plans to celebrate the milestone in question. 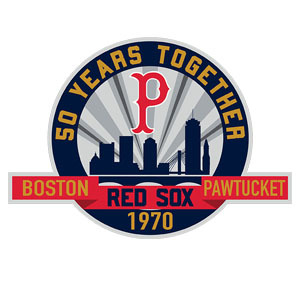 From 1970-72, the PawSox were a Double-A Eastern League team; their current status as a Triple-A International League team began in 1973. This affiliation is the second-longest in Triple-A and third-longest in all of Minor League Baseball. It's all coming to an end, of course, when the team moves to a new ballpark in Worcester, Massachusetts, in 2021. But in 2019, it will be business as usual in Pawtucket, except that the club will celebrate its 50th season as a Red Sox affiliate at McCoy Stadium. In addition to an anniversary logo, the PawSox are marking the occasion via their Celebrate Rhode Island initiative, which includes free tickets for young fans, charitable activities and a traveling "PawSox Rhode Show." The AquaSox began life as the Everett Giants, following a relocation from Walla Walla, Washington. The team changed its name to the AquaSox in 1995, when it began an affiliation with the Seattle Mariners that continues to this day. The AquaSox have played at Everett Memorial Stadium since their inception; earlier this month the facility's name was changed to Funko Field as part of a sponsorship agreement. General manager Danny Tetzlaff said in a January press release that the logo "represents our past affiliation with the Giants and our longstanding relationship with the Mariners." Further details regarding the team's anniversary celebrations will be announced at a later date. The Scranton-Wilkes Barre RailRiders, owners of Minor League Baseball's longest moniker, don't play in Scranton or Wilkes-Barre. The Moosic, Pennsylvania-based franchise, formerly the Maine Guides, set up shop in 1989 as the Philadelphia Phillies-affiliated Red Barons. They changed their name and affiliation to the Yankees in 2007 and adopted their current RailRiders name in 2013 (this came after the team spent the 2012 season on the road due to a near-total rebuild of their PNC Field home). 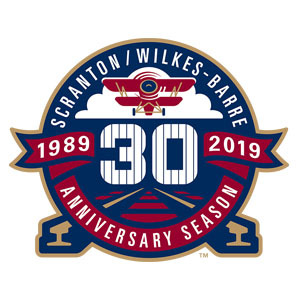 Scranton/Wilkes-Barre's 30th anniversary logo has elements that reference all three team names, forming the basis of the club's season-long promotional theme. Most notably, the "All-Time Team" bobblehead series honors one player at each position. These nine bobbleheads connect with one another to form a playing field. 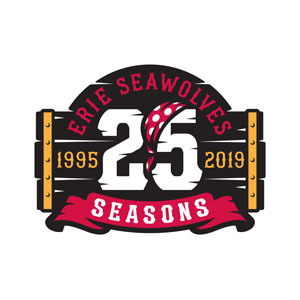 The SeaWolves began life in 1995 as a Pittsburgh-affiliated Class A Short-Season New York-Penn League team. They switched to the Eastern League in 1999 and, after two seasons with the Anaheim Angels, began their current Detroit Tigers affiliation in 2001. The SeaWolves are celebrating all season long. There will be a series of replica jersey giveaways, with each jersey representing a different era in team history. Meanwhile, during Thursday home games, the SeaWolves will suit up in "mash-up jerseys which fuse elements from the team's original 1995 uniforms and its current set." It all culminates with their 25 Seasons Celebration Game on July 27, when they honor distinguished alumni as well as longtime fans, season-ticket holders and partners. 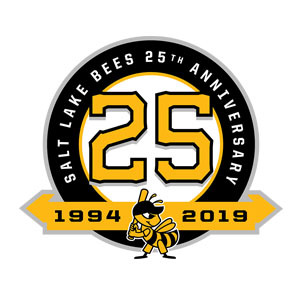 Salt Lake has been a consistent PCL entity over the past quarter century, beginning as the Buzz and then transforming into the Stingers before ultimately settling in as the Bees in 2006. They spent their first seven seasons as a Minnesota Twins affiliate before beginning their current relationship with the Angels in 2001. For this, their 25th anniversary season, the Bees will suit up as both the Buzz (April 11, July 25) and the Stingers (June 25) while also occasionally donning an alternate 25th anniversary gold uniform. The Timber Rattlers, formerly the Appleton Foxes, began play at their current home of Fox Cities Stadium in 1995. After 14 seasons as a Seattle affiliate, they partnered with the Milwaukee Brewers in 2009. 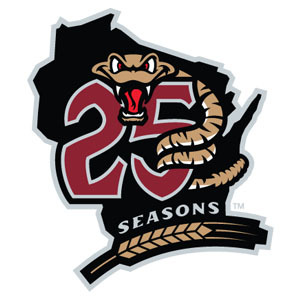 The team's 25th anniversary logo, featuring a timber rattler over an outline of the state of Wisconsin, was unveiled in November. Throughout the season, they're asking fans to share their memories, which will be featured on the stadium scoreboard, social media and in the team's PlayBall! magazine. 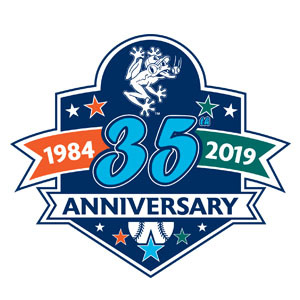 Twenty-fifth anniversary promos include Party Like it's 1995 Night (featuring throwback ticket and concession prices) on April 25 and a retro 1995 bobblehead of mascot Fang on April 27. The Dragons entered the Midwest League in 2000, and since then they've sold out all 1,136 games that they've played at Fifth Third Field (setting an all-time professional sports record in the process). The team, a Cincinnati Reds affiliate since the beginning, is kicking off its campaign with Saturday's 20th Season Celebration Game. This unique tilt will feature the 2019 Dragons playing against a group of Dragons alumni who are still in the Reds system, including Taylor Trammell, Tyler Stephenson and Jonathan India. Throughout the offseason, the Dragons have been compiling a "20 Greatest Dragons" list, recognizing the players who have made the biggest impact. The Dragons aren't the only team in the Reds organization celebrating an anniversary in 2019. 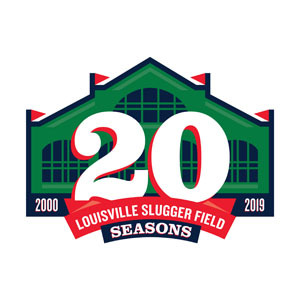 The Bats (originally known as the RiverBats) began playing at Louisville Slugger Field in 2000, which was also the first season of their Cincinnati affiliation. The logo features the stadium facade (repurposed from its previous existence as a train station), and celebratory plans include a RiverBats throwback weekend (July 12-13) as well as a bobblehead of famous vendor Elizabeth "Cookie Lady" Kizito. The Express began life as a Double-A Texas League franchise in 2000, transitioning to the Pacific Coast League in 2005. They were an Astros affiliate from 2000-10; they are back with Houston in 2019 after eight seasons with the Texas Rangers. 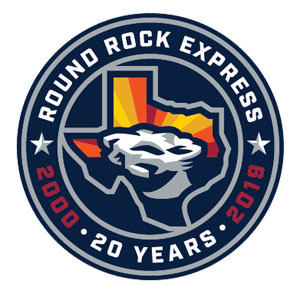 The Express announced their affiliation with the Astros on Sept. 20, also unveiling a new set of logos that includes a 20-year mark designed to showcase "the iconic round rock that the city is named for perched in front of an Astros' rainbow-inspired sky commemorating the dawn of a new affiliation." The Express open their home campaign on April 9 with a 20th anniversary coin giveaway. 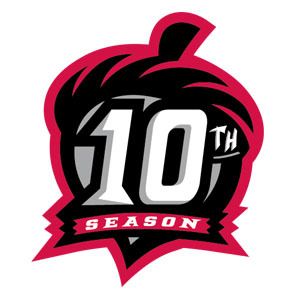 The Eastern League's Richmond Flying Squirrels, a Giants affiliate, began play in 2009 after relocating from Norwich, Connecticut. 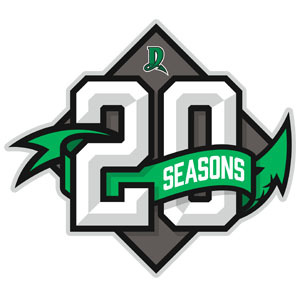 Their 2019 promo schedule is dedicated to commemorating their decade of existence, with 10 unique giveaway items celebrating team alumni (these include a Brandon Belt Giraffe hat and a Joe Panik "Panik Button" T-shirt). Additionally, they're bringing back 10 "memorable past promotions," encompassing everything from Mini Wrestling to an appearance by the Human Cannonball.